This question isn’t as innocent as it sounds, as there are at least four ways to say it. The word jacana descends from the Tupi jasanã? by way of the Portuguese jaçanã. That funky ç, called a cedilla, is used in Portuguese to denote a soft c and while the cedilla isn’t often used in most spellings of Northern Jaçana, it technically belongs there. Thus, a straight reading of the word would be Zha-sah-NAH. However, the discussion doesn’t end there. Ways to pronounce or mispronounce this word are legion. Many, like myself, tend to eschew the traditional pronunciation of jacana for an Anglicized Jah-KA-nah. For the record, this is the way one refers to the other seven species in the family Jacanidae. Others meet tradition halfway with Jah-sah-NAH. Still other interpretations, influenced by Spanish, the dominant language of the American tropics, refer to spinosa as Ha-KA-nah or Ha-sah-NAH. So how about you? How do you pronounce jacana? I voted for Jah-KA-nah simply because that’s how a German (or any other foreign birder) would pronounce it without any background information. Frankly, if you’re going to incorporate foreign words into your language, spell them in a way that suits their pronounciation. Foreigners have enough trouble figuring out why “ghoti” isn’t an appropriate way of spelling “Fish” (gh = “f” from enough, o = “i” as in women, ti = sh as in nation). We don’t need bird names to cause us even more headaches. 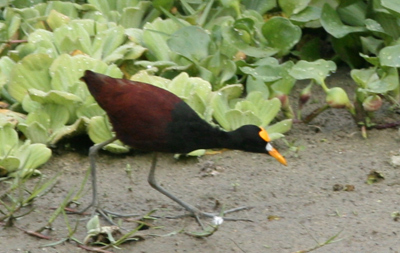 If you want people to pronounce the bird Jacana differently, e.g. Jah-sa-NAH, then please spell it Jahsanah and not Jacana! Okay, this thought however must be taken with a good grain of salt as the one commenting is from a nation (Germany) that uses words like Salzwasserdestillationsanalge and one of our nicest bird names is Schwarzschnabelsturmtaucher (although taxonomical changes made a name change to Atlantiksturmtaucher necessary, much better, right?). The Jacanas by the way are called “Little Leaf Chickens” in German. Just a suggestion in case the poll doesn’t lead to a clear result. Jah-KA-nah is how I pronounce it too. I suppose there’s always ‘lilytrotter’. I hadn’t considered Little Leaf Chicken or lilytrotter. Thanks, Jochen and Snail. However, since you both have jacanas with unambiguous pronunciation, I don’t think you can truly understand our pain here! Patrick, that’s the pronunciation that should be in the poll. I’m adding it. Also, thanks for the link. What a coincidence! I saw my life jacana in Amazonian Brazil, and will always use the Tupi pronunciation–zha-sa-NAH–because it’s a Tupi word. It’s also pretty, and fun to make people whip their heads around at you in puzzlement. What fun it was to bird with you in Guate! I know that bird… just blogged him myself! Most of the guides I’ve spent time with in Central America also say “Jah-KA-nah” so I’ve always deferred to this pronunciation as well without considering the deeper ramifications of word origin, etc. It was great birding with you, sorry you had to leave us before it was all said and done! When I was in South America last year, I noticed the Jacana was pronounced Ha-KA-na, so I did likewise. However, Jacanas occur elsewhere so I’d usually go for an Anglicised Ja-KA-na. I also saw some jah-KA-nahs last week in Costa Rica, Mike. Cool birds. I always thought it was ya-KA-nah. Foreign languages were never my strong point. How good looking bird! I love this color so much. I’ve seen it for first time. Really mind blowing. In spanish the j is sounded like h so I think ha kan naA mite b correct. A beauty however u care to pronounce it. Phil wrote: “In spanish the j is sounded like h so I think ha kan naA mite b correct.” One problem with this: as Mike wrote up at the top, the origin of this word is not Spanish. Of course words incorporated from one language to another often are pronounced differently than in the language of origin, and those pronunciations ultimately may become considered correct by common usage (or misusage, if you prefer). That being said, I have no idea what would be considered THE correct US English pronunciation, if there is a single correct pronunciation. My opinion is that one should know the correct pronunciation but go with what’s recognizable. Most people say “lahn-je-ray” (lingerie) and are understood, and “chaise lounge” (chaise longue) and are understood. What is the National Bird of Guatemala? Can we all please shut up about Aflockolypse now? Where Are You Birding This Second Weekend of March 2011?